Regardless the type of wood you are using: Green, Reclaimed, Lived Edge... having it kiln dried is so important. Many would be shocked at the high moisture content of some wood species. Since trees comprise an autonomous Eco-system of water and nutrients, it stands to reason that sapwood (the layer next to the bark) is generally higher in moisture content than heartwood (inner wood which has died). Sapwood distributes water and nutrition through a tree. The heartwood, or inner wood, becomes infiltrated with gums, resins, and other materials. 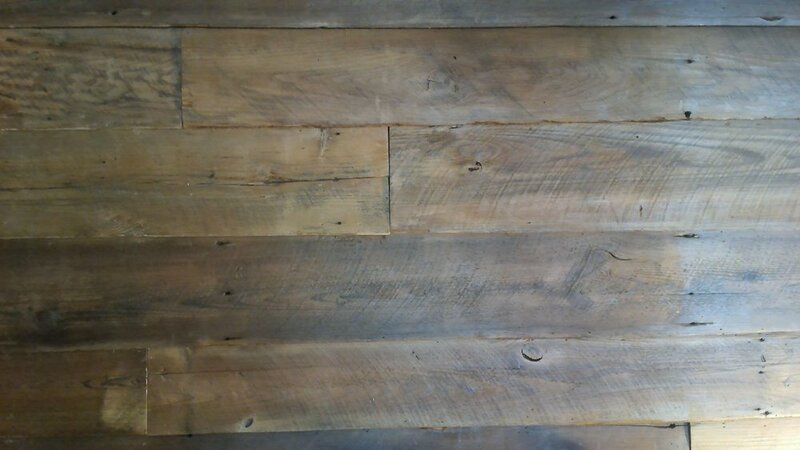 Reclaimed lumber has air dried for many decades. So many feel that there is no need for kiln drying. That is simply not true. Dimensional lumber that is 1 to 2 inches thick requires kiln drying for a couple of reasons. First, the lumber still holds true to the relative humidity levels that are outside. Those differ from the levels inside of your home or office greatly. What does this mean for you? If the reclaimed lumber is not kiln dried, it is likely that it will warp and/ or shrink as it works to reach the relative humidity level inside your home or office space. Lumber is tubular as the amount of moisture in those tubes decrease the width of the lumber shrinks. Second, kiln drying the wood allows you to control the speed at which this process take place which can reduce cracking/checking of the wood. Let's take a look at how this happens. Kiln Dry 1 and 2 inch thick reclaimed lumber. A wood’s moisture content is also a dynamic exchange between the wood itself and the surrounding air. When the relative humidity in the air rises, wood absorbs moisture from the air; when the relative humidity falls, wood releases moisture into the air. This occurs naturally, and it occurs throughout a wood product’s lifespan even after it has been harvested and kiln-dried for human use. As wood is always trying to find a balance with its environment wood producers, builders, and consumers need not fret over such an organic, natural process, but a thorough knowledge of it will guarantee success with wood in all sorts of product applications. The key to wood strength and performance over time is to dry the wood appropriately to its optimum moisture content depending upon the end product’s service conditions and the end product’s installation destination. This is where Kiln Drying comes into play. Wood must be kiln-dried in order to be used as construction grade lumber for building purposes. Lumber production is a complex process in which wood is milled, dried and processed. Kiln-drying is basically a process of placing lumber into kilns where heated air is circulated and the temperature and relative humidity of the kiln is controlled for the purpose of reaching the wood’s equilibrium moisture content: a balance between the moisture content of the wood, and the relative humidity of its surrounding environment, depending upon the end wood products application specifications. Once the equilibrium moisture content is achieved, a wood’s moisture content can vary with slight changes in the relative humidity of the surrounding environment without jeopardizing the strength and structural integrity of the end wood product. Simply because the kiln drying process has taken place it does not stop the wood from seeking relative humidity. That is why flooring for example is housed in the location that it will be installed for a period of time before it is placed. This allows that process of equilibrium to finalize before the wood is used. A wood moisture meter is crucial in establishing and maintaining healthy wood moisture content levels at each stage of lumber production. A wood moisture meter is a tool which measures the wood’s moisture content. Kiln operators carefully monitor and control the process.t. Kiln operators deploy hand-held wood moisture meter products to conduct as many spot-checks as needed to verify the mill’s kiln-drying efficiency.